Whatever it is, make sure it FITS YOUR HEAD. About 10% of helmets come off in crashes. Fasten the strap. Don’t buy a helmet you haven’t had on YOUR head. 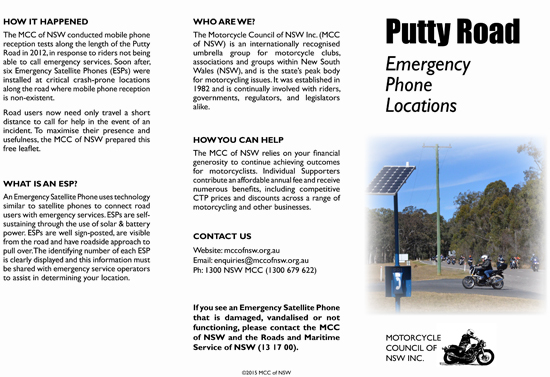 On Friday the 11th of December 2016, NSW Road Rule 270 was amended to allow the use of the International Helmet standard UN ECE 22.05 in NSW. 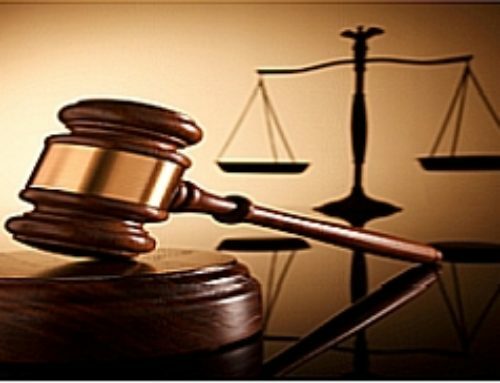 This Amendment additionally moved the definition of an approved motor bike helmet into the published road rule, rather than the past practice of obscuring the definition in date-order Government Gazettes. While the National Road Rule Road Rule 270 is basically the same in all states, requiring a rider to wear an approved helmet correctly fastened on their head, the definition for an approved motor bike helmet continues to vary within each state. 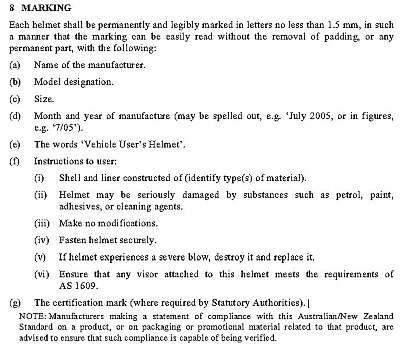 ALL States and Territories now require use of an approved helmet that bears evidence of having been Certified as compliant with AS/NZS 1698:2006, or ECE 22-05 or AS 1698-1988. The “evidence” is a mark, label or sticker in and/or on the helmet. European helmets are “homologated” by a European government. 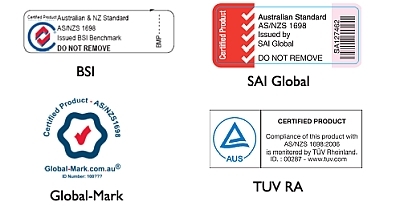 Australian Standard helmets are “Certified” by a privately owned certification services company. The labels are quite different, reflecting the different processes. The introduction of ECE 22-05 helmets since 2016 has been warmly welcomed by riders, allowing safer helmets and a less restricted market. This requires a label sewn onto the chin-strap (“retention system”) that carries quite specific (and very informative) information. i.e. 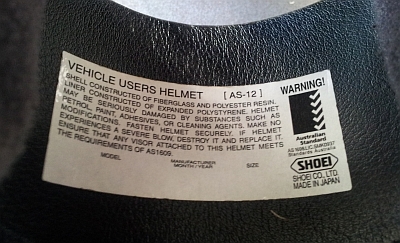 this helmet was homologated by the British government. Of interest, this is a “flip up” helmet that achieved homologation as BOTH an open face and full-face; the chin-bar can rotate to a locked position at the rear and does not form a “protrusion”. Critical information is easily decoded from 050113 P/J – 553863 as seen on the label above. The above tells us who to contact for full compliance test details of THIS helmet (for proof of design and proof of production reliability). 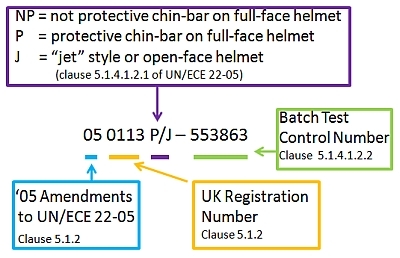 The Batch Test Control Number links THIS helmet to the particular production batch it came from and the batch tests for that batch. It’s under regulatory control. 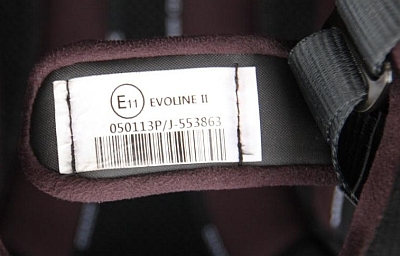 If it doesn’t have the chin-strap tag with the above details, it’s not UN/ECE 22-05 compliant, despite any other labels. 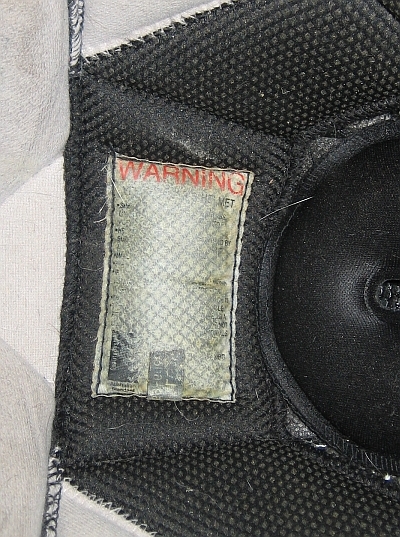 On some ECE helmets, the label is behind a sheathing over the chin-strap. 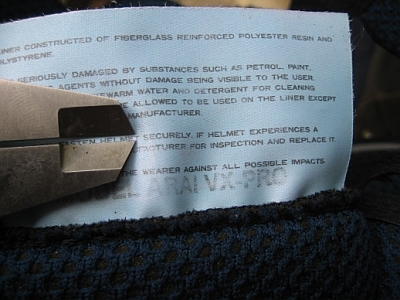 To read the label, the sheathing can be pushed back while holding the strap with the other hand. 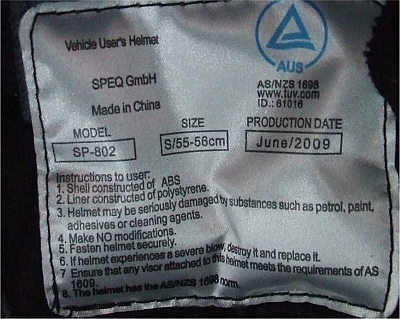 For Australian Standards, you need to find an approval label inside the helmet that has details required by AS/NZS 1698:2006. 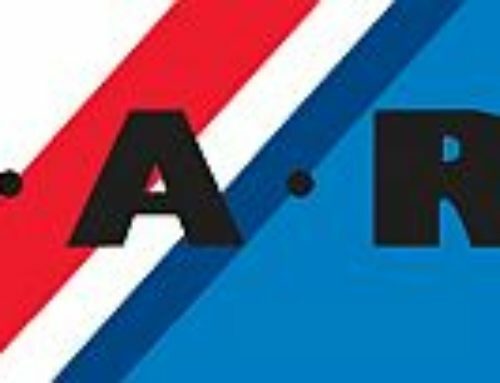 Labels required by AS 1698-1988 are the same. Clause 8 of AS/NZS 1698 requires marking that can be “easily read without removal of the padding”. These are INSIDE the helmet. 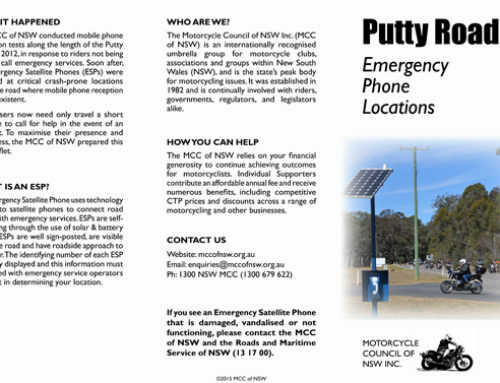 The NSW road rule restricts the market to a small group of local certification companies. The “approved company” labels are listed on the RMS website. The marks shown may be on the inside label or on the outside label. 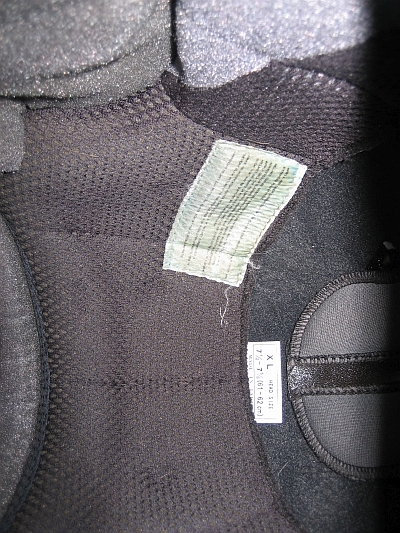 Police will often look only for the external label. Many helmets have labels that wear off or become illegible over time due to sun exposure, sweat and wear. 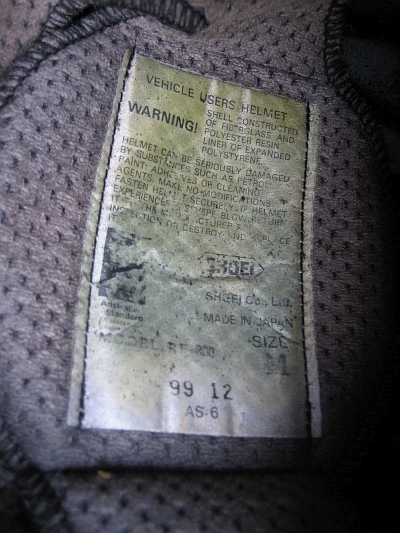 Some helmets never had all the required internal labels, even when new. However, even if it only has an external sticker as shown on the RMS website, it is “approved”. 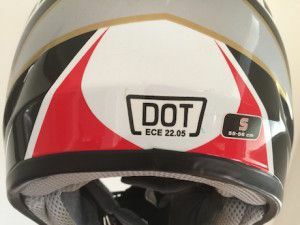 The introduction of ECE 22-05 helmets since 2016 has been warmly welcomed by riders, allowing safer helmets and a market less restricted by regulatory protection.